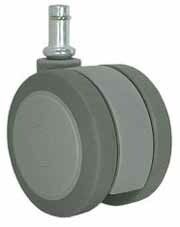 Extra large diameter chair caster rolls easily on both carpet and hard floors. Non-mar soft tread is safe for hardwood and tile floors. Large-diameter chair caster rolls easily on both carpet and hard floors. Non-mar soft tread is safe for hardwood and tile floors. Large 75 mm (2.95") wheel-diameter rolls easily on soft flooring. Soft tread is designed to roll easily on carpet, hardwood floor, or on tile floors. Note: Installed height is 2.95". In many cases, this will raise the height of your chair.